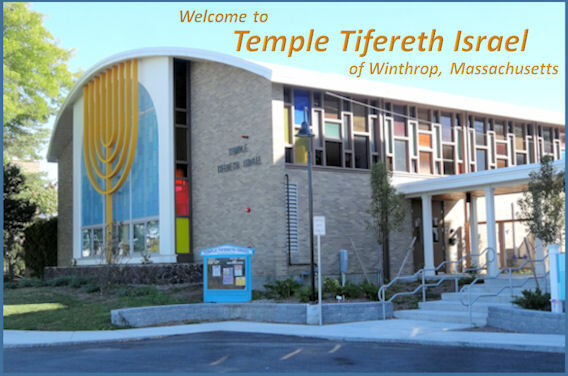 Temple Tifereth Israel is located at 93 Veterans Road in Winthrop. It can easily be reached by car or by public transportation. To reach Temple Tifereth Israel by public transportation, take the MBTA's Blue Line to the Orient Heights T station. Board the Winthrop Center bus and ask the bus driver to inform you when you are at the Temple on Veterans Road. The bus stop is right in front of the Temple. By car, follow the directions below. For addtional information visit this link at Google Maps. 1. I-93 N / US-1 N / MA-3 N / SOUTHEAST EXPRESSWAY toward BOSTON. 2. Take EXIT 20 toward I-90 / LOGAN AIRPORT / WORCESTER / S. STATION. 3. Merge onto I-90 E / MASS PIKE / MASSACHUSETTS TURNPIKE via the exit on the LEFT toward LOGAN AIRPORT / SOUTH BOSTON.- 4.1 miles. 4. At end of I-90, after passing through Ted Williams Tunnel and Logan Airport, take the exit toward RT-145 / BENNINGTON ST / CHELSEA.- 0.1 miles. 5. Proceed straight onto BENNINGTON ST / MA-145.- 0.9 miles. 6. Turn RIGHT onto SARATOGA ST / MA-145. Continue to follow MA-145.- 0.8 miles. 7. Stay STRAIGHT to go onto MAIN ST.- 0.4 miles. 8. Turn SLIGHT LEFT onto REVERE ST.- 0.1 miles. 9. Turn RIGHT onto SHIRLEY ST.- 0.2 miles. 10. Turn RIGHT onto MA-145 / VETERANS RD.- 0.1 miles. 11. END at Temple Tifereth Israel, 93 Veterans Rd, Winthrop, MA 02152-1619. 1. Take US-1A South toward BOSTON and LOGAN AIRPORT. 2. Turn LEFT at the EXIT for MA-145 / WINTHOP. 3. At small rotary and flashing light, go STRAIGHT, staying on MA-145. 4. At traffic light, cross BENNINGTON ST, stay on MA-145 / SARATOGA ST.
5. Continue to follow MA-145 / SARATOGA ST. - 0.8 miles. 6. Stay STRAIGHT to go onto MAIN ST.- 0.4 miles. 7. Turn SLIGHT LEFT onto REVERE ST.- 0.1 miles. 8. Turn RIGHT onto SHIRLEY ST.- 0.2 miles. 9. Turn RIGHT onto MA-145 / VETERANS RD.- 0.1 miles. 10. END at Temple Tifereth Israel, 93 Veterans Rd, Winthrop, MA 02152-1619. 1. Take I-90 E / MASS PIKE / MASSACHUSETTS TURNPIKE to end of I-90. 2. Merge onto I-90 E / MASS PIKE / MASSACHUSETTS TURNPIKE via the exit on the LEFT toward LOGAN AIRPORT / SOUTH BOSTON.- 4.1 miles. 3. At end of I-90, after passing through Ted Williams Tunnel and Logan Airport, Take the exit toward RT-145 / BENNINGTON ST / CHELSEA.- 0.1 miles. 4. Proceed straight onto BENNINGTON ST / MA-145.- 0.9 miles. 5. Turn RIGHT onto SARATOGA ST / MA-145. Continue to follow MA-145.- 0.8 miles.